Welcome to Earth Services, LLC, a family owned and operated company that was started in 1983 by John Held. We've built our business by constantly keeping customers happy and making the Denver metro area a much greener and beautiful place to live. • We can irrigate vegetable gardens, trees, shrubs, hanging pots, potted plants, your livestock and even your pets water dish! In addition to new installs, we also maintain and repair any type of manual or automatic sprinkler system, including Hunter or Rainbird. No job is to big or to small, we can handle residential, commercial, sports fields and even lofts in downtown Denver. Compare us to other sprinker companies, we offer value to our customers like no other! • Advertising is mostly word of mouth - when your happy how could you not tell your friends and family about us? 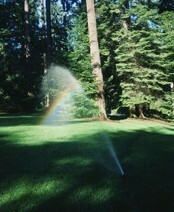 Call us today for all your irrigation needs or if you have any questions about your sprinkler system. We look forward in hearing from you and serving you in the future! Contact us in Denver, Colorado, for more information on our sprinkler service.